As the Special Envoy of President Xi Jinping, State Councilor and Foreign Minister Wang Yi will pay a working visit to Russia from March 27 to 28. 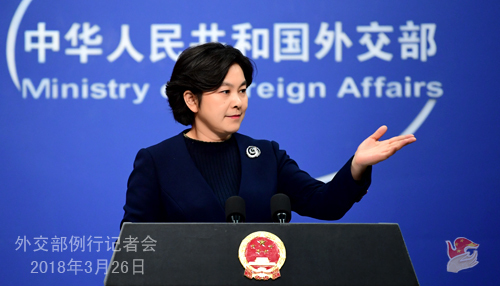 Q: According to reports, US Vice President recently said that the new tariffs the US is going to impose on Chinese goods indicate that the era of America's economic surrender is over. US Commerce Secretary said that what they are starting is a prelude to negotiations rather a trade war. What's your reaction to this? A: I have seen relevant reports. Certain American official's remarks that "the era of economic surrender is over"sounds quite awkward and it seems that they were trying to shift the blame. In fact, it would be more appropriate to say that it's time for the US economic intimidation and hegemony to end. The US side should be clear that what international trade needs in the 21st century is rules rather than power. China has all along followed the WTO rules and upheld the transparent, non-discriminatory, open, inclusive and rules-based multilateral trading system with the WTO at its core and based on rules. It always maintains that divergences, including those frictions in trade, should be resolved through negotiation in the spirit of mutual respect, equality and mutual benefit. In fact, China and the US have been in consultations on trade issues. Indeed, we have confidence and capability to defend our nation's legitimate rights and interests under any circumstance. Now the ball is in the US court, and we hope it will make rational and cautious decisions and choices. Q: Last Friday, the US delegation in Geneva, while discussing a human rights draft resolution China formulated, said that China was seeking to glorify the vision proposed by itself through relevant draft resolution and the US voted against it. How does China respond to this? A: The remarks of the US official in Geneva mentioned by you do not hold water at all and also reflect their habitual ignorance and arrogance of certain people in the United States as always. Actually, the resolution titled "Promoting Mutually Beneficially Cooperation in the Field of Human Rights" jointly submitted by China and relevant countries to the 37th Session of the UN Human Rights Council was adopted by an overwhelming majority. The resolution calls on all relevant parties to promote mutually beneficial cooperation in the field of human rights, step up dialogue and cooperation, support the building of a new type of international relations featuring mutual respect, fairness, justice and mutually beneficial cooperation and foster a community with a shared future for mankind. The international community has reached an important consensus that only through dialogue and cooperation can the human rights cause of all countries be better promoted and protected. Therefore, When making comments at the Session, a number of countries said that the China-sponsored resolution gives full expression to the shared aspirations of the international community and will help to increase the say and the agenda-setting right of the developing countries in the field of international human rights and promote the sound development of global human rights cause. I do not know whether the US official mentioned by you has made clear such a fact that the UN Human Rights Council's voting on the above-mentioned resolution was requested by the United States itself. There were 28 for and 1 against it. Amid the green "Yes" on the vote-tallying screen, the red "No" by the United States stood out, alone. I do not know what explanations would the US make on this. I would like to stress once again that building a new type of international relations and fostering a community with a shared future for mankind is the overarching goal of the major-country diplomacy with Chinese characteristics. China stands ready to work with the relevant parties of the international community to actively implement the relevant UN resolutions. We are still willing to enhance communication and exchanges with the United States and other relevant parties so as to inject positive energy into the development of the global human rights cause. Q: In an interview with the South China Morning Post, India's Ambassador to China Gautam Bambawale repeatedly stressed that India has no concerns about China's rise. India looks at China's rise as something that encourages it to develop rapidly and it doesn't look upon China as a competitor, rival or threat. Instead, it treats China as partner in progress and development. What's China's response to that? How does China comment on Mr. Bambawale's remarks? A: We have noted relevant reports and applaud Ambassador Bambawale's positive remarks. The fast development of China and India presents important opportunities to each other and the world at large. China and India face similar national conditions and development goals and are in similar development stages. We also share extensive common interests and should be each other's partner in the course of development and progress. Under the guidance of the important consensus of the leaders of the two countries, we stand ready to work with the Indian side to enhance political mutual trust, improve mutually beneficial cooperation, properly manage differences and achieve common development. Q: On March 25, Chairman of the US House Intelligence Committee Devin Nunes said that his committee will investigate China's efforts to gain military and economic power in Africa. He believes that China is looking at investing in ports and infrastructure around the world, not just for military capabilities but also to control those governments. What is your comment? A: There is a Chinese saying which goes "one's mentality will determine how he perceives the world". There is also another proverb that "if one suspects his neighbor of stealing his ax, all the behaviors of that innocent neighbor appear suspicious to him", which refers to someone that harbours groundless suspicions in disregard of facts. We hope that relevant people in the United States can be more open-minded, and aboveboard and refrain from viewing normal cooperation with tinted glasses or interpreting other countries' goodwill to pursue win-win outcomes with a hegemonic mindset. China always conducts cooperation with African countries in accordance with the vision of sincerity, real results, affinity and good faith and the principle of upholding justice while pursuing shared interests. China's considerations for its cooperation with African countries, if there are any, are fairly simple and transparent. As its good brother, good partner and good friend that share weal and woe, China welcomes African countries aboard the express train of its development and is willing to make positive contributions to promoting the peace, security, development and rejuvenation of African countries. Q: According to the Wall Street Journal, US Treasury Secretary Steven Mnuchin is considering coming to China for negotiations on the issue of trade. Is China willing to invite him? 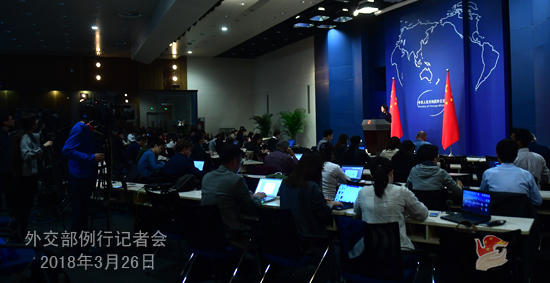 A: Regarding the China-US trade issue, we always emphasize that China is willing to engage in consultations with the US side under the principle of mutual respect, equality and mutual benefit to properly resolve differences. The door for dialogue and consultation always remains open. Q: What are the special considerations for Special Envoy Wang Yi's visit to Russia? Please brief us on the arrangements and expected outcomes of this visit. A: State Councilor and Foreign Minister Wang Yi's visit to Russia as the Special Envoy of President Xi demonstrates the uniqueness of China-Russia relations which are operating at a high-level. President Putin has just been reelected as the President of Russia and China-Russia relations now face new opportunities for development. State Councilor and Foreign Minister Wang Yi will meet with Russian leaders and hold talk with Foreign Minister Sergei Lavrov, during which they will have an in-depth exchange of views on the arrangements for the exchange of high-level visits within the year and stepping up bilateral cooperation in key areas. Q: In the interview, Indian Ambassador Bambawale made the observation that the status quo on the China-India boundary should not be changed so as to avoid future Dong Lang incidents. He also suggested that the borderline should be demarcated in order to properly settle this issue. What is your response? A: I just responded to the positive remarks concerning China-India relations by Ambassador Bambawale in his interview with the South China Morning Post. You mentioned his other remarks on Dong Lang and the border issues, and I would like to make some responses. China has been committed to upholding peace and stability in the China-India border areas. The Sikkim section of China-India boundary has been demarcated by historical agreements and Dong Lang is China's territory. There is no such an issue as the change of status quo since China is exercising its sovereignty and conducting other sovereign activities on its own territory. Last year, the two sides worked together to peacefully resolve the Dong Lang incident with diplomacy and wisdom. We hope that India will draw lessons from that, abide by historical boundary treaties and basic norms governing international relations, and work with China to safeguard peace and stability of border areas in an effort to create good atmosphere for the positive development of bilateral relations. As to the China-India boundary issue, China's position on that remains consistent and unequivocal. The eastern, central and western sections of the boundary has never been demarcated officially. 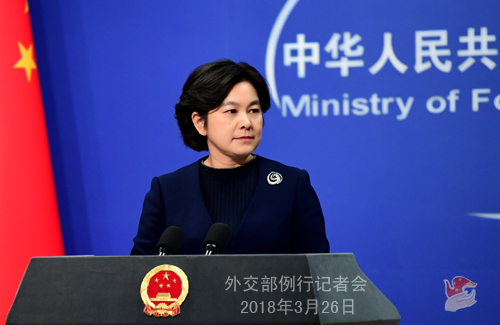 China is committed to settling territorial disputes through negotiation, and China and India are in discussions for resolving territorial disputes through negotiation in an attempt for a fair and reasonable solution that is acceptable to both sides. Pending final settlement of the boundary issue, the two sides should work together to uphold peace and stability in the border area. Q: According to reports, American officials expressed concerns over China's decision to stop imports of "foreign garbage" on March 23 at the WTO Council for Trade in Goods meeting, saying that China's import restrictions on recycled commodities have caused a fundamental disruption in global supply chains for scrap materials. China seemed to be violating WTO obligations, treating domestic and foreign garbage with discrimination and taking excessive trade restrictions. The US asked China to stop implementing relevant measures immediately. What's your comment? A: During the Two Sessions this year, Minister of Environment Protection Li Ganjie already took relevant questions on "foreign trash". I would like to say that the so-called "concerns" of relevant US officials are unjustifiable, illegitimate and have no legal basis. Prohibiting the imports of foreign garbage and reforming the management system of solid waste imports are a major measure the Chinese government has taken in order to follow through on the new concept of development, improve the ecological and environmental quality and safeguard national ecological security and the health of people. This is also a right China is entitled to under international law and has been firmly supported by the people. The US officials are so hypocritical as they try to make an issue out of China's legitimate and lawful actions and accuse China of "seemingly violating WTO obligations". How could they claim that their restrictions on its exports of high-tech and high value-added products to China are legitimate while China's lawful restrictions on its imports of foreign garbage are illegal? In fact, the Basel Convention on the Control of Transboundary Movements of Hazardous Wastes and Their Disposal launched in the late 1980s fully confirms that all countries are entitled the right to prohibit foreign hazardous and other wastes from entering their territory. The Convention also stipulates that countries have the obligation to ensure that hazardous wastes and other wastes within it are minimumized and disposed as close as possible to their place of generation. We hope that the US side could focus on reducing, disposing and treating the hazardous wastes and other wastes it generated in accordance in the spirit of the Basel Convention and fulfill its due responsibilities and obligations for the world. After the press conference, the following question was raised by a Russian journalist: What's China's comment on the fire that broke out at a shopping mall in a Siberian city of Kemerovo in Russia on March 25? A: We have noted relevant reports. We are deeply saddened by the major casualties resulted from the fire in the Siberian city of Kemerovo and would like to send our heartfelt condolences to Russia. We mourn for the victims and wish all the injured a speedy recovery.